All products are handcrafted with love and intent by Christina Wilke-Burbach and Bill Burbach (screen printer and artist). Mind, Soul, and Selfcare products include Chakra Clothing, Chakra Balancing products, herbal products, and aromatherapy products. Available for purchase through Paypal. You do not need a Paypal account to use Paypal, you can also use a debit or a credit card. Shipping available anyway in the United States. Shipping price for all orders is a flat rate of $6.50. All orders are shipped within two business days with tracking information. All sales are final. No refunds or exchanges. 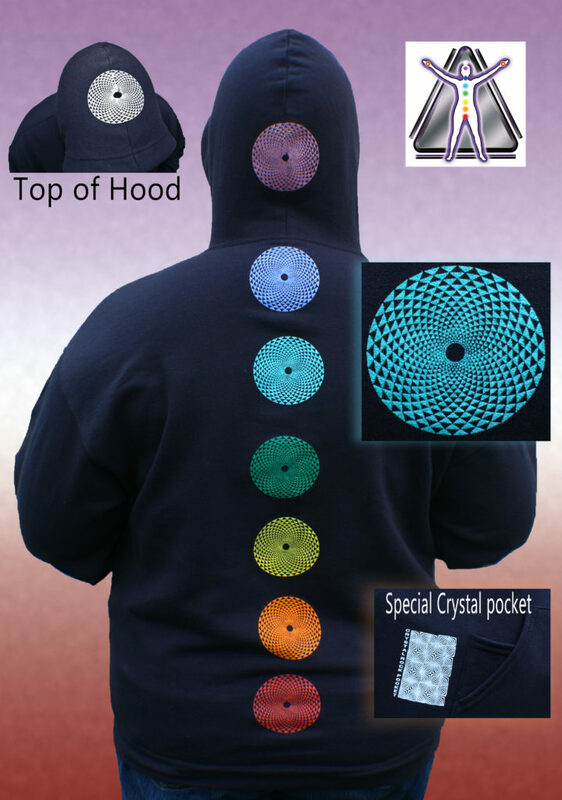 New Chakra Hoodie Sweatshirts Now Available!!! Designed and printed by Bill Burbach of DoneGraphix. 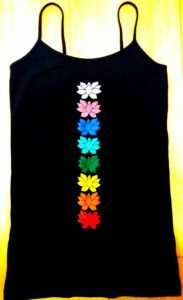 Chakra Sweatshirt by Mind, Soul, and Self LLC have the Chakras in the correct anatomical position. Chakra vortex design swirls into the lotuses and features 8 chakras, including the higher heart. Sweatshirts also feature a Crystal Rock Pocket in the front for you to keep your crystals close by!!! Available in sizes Small to 2XL. Each sweatshirt is customized and made just for you. Please allow 1 to 2 weeks for printing and shipping. Keep your balance with our tank tops depicting the 8 main energy centers as lotus flowers down the center of the shirt (where the Chakras are located). Designed and silk-screened by Bill Burbach. Tank Tops are available in black and are 95% cotton/5% spandex. Sizes available small to 3XL. Limited stock for the summer! 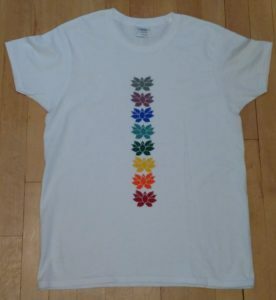 Keep your balance with our T-Shirts depicting the 8 main energy centers as lotus flowers down the center of the shirt (where the Chakras are located). Designed and silk-screened by Bill Burbach. 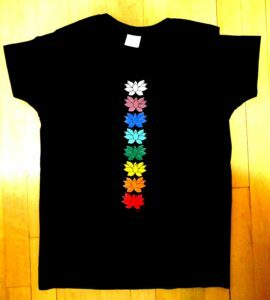 Chakra T-Shirts are available in black or white and are 100% preshrunk cotton. Sizes available small to 2XL. Please allow 1 to 2 weeks for printing and shipping. 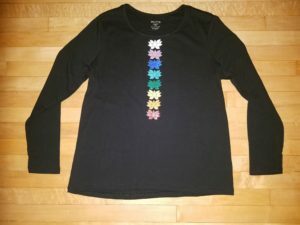 Keep your balance with our long sleeve T-Shirts depicting the 8 main energy centers as lotus flowers down the center of the shirt (where the Chakras are located). Designed and silk-screened by Bill Burbach. Chakra Long sleeve T-Shirts are available in black or white and are 100% preshrunk cotton Available in sizes Small to 2XL. 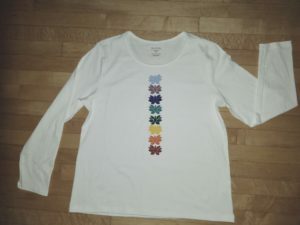 Each long sleeve T-Shirt is customized and made just for you. Please allow 1 to 2 weeks for printing and shipping. One of our most popular products! 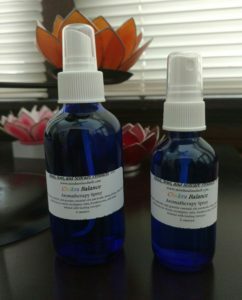 A spray/mist blend of authentic and genuine essential oils; one oil for each of the main chakras. Blended into spring water. Use spray to cleanse and balance your energies centers. Product is infused with Reiki and Light Body Energies. Available in 2 ounce glass spray bottle or 4 ounce glass spray bottle. 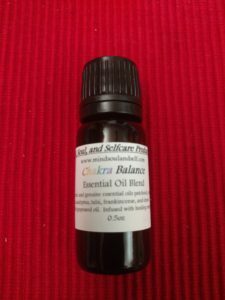 A blend of authentic and genuine essential oils; one oil for each of the main chakras. Skin safe 10% dilution in coconut oil/grapeseed oil. You can apply topically to your chakras, inhale with affirmations/visualizations, diffuse, or wear as a perfume. Intent is to cleanse, balance, and heal your energies centers. Product is infused with Reiki and Light Body Energies. Bottle is 0.5 ounces. Silk screened and hand painted on oak panel by Bill Burbach. 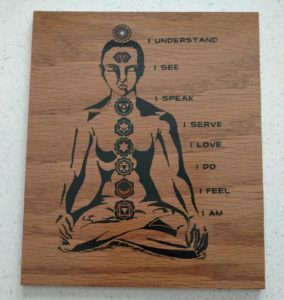 Depicts the main energy centers in the body and their corresponding colors and affirmations. Great for use in meditation or as a wall hanging. Measures 7 inches wide, 8.5 inches tall. A yummy herbal product for date night! Elixirs are herbal tinctures/extracts that have honey, syrups, and/or sugar added to them to make them more palatable. This elixir is an Aphrodisiac. Supports Sacral Chakra and sexual health. 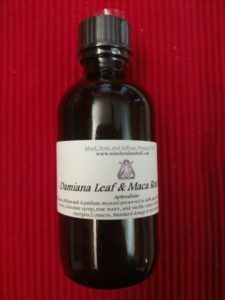 Damiana Leaf (Turnera diffusa) and Maca Root (Lepidium meyenii) preserved in 40% alcohol, with local raw honey, chocolate syrup, rose water, and vanilla extract. Infused with healing energies. As of the last update, we found no reported interactions between this supplement and medicines. It is possible that unknown interactions exist. If you take medication, always discuss the potential risks and benefits of adding a new supplement with your doctor or pharmacist. 2 ounces. Try one to three teaspoons as needed. One of our most popular products!! Christina’s version of smudging, an energy clearing ritual. 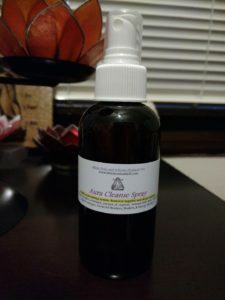 Aura Cleanse Aromatherapy Spray is a combination of the genuine and authentic essential oils of the herbs burnt in smudging ceremonies: cedarwood, sage, lavender, juniper, cypress, rosemary, and witch hazel. Blended into Spring Water. Infused with Reiki and Light Body energies. Spray is used to purify your energy system and clear your space of negative, dense, and unwanted energies. For external use only. 4 ounce bottle. *** Disclaimer: Information, statements and products on this website have not been evaluated by the FDA. The information provided on this site is for informational purposes only and is not intended as a substitute for advice from your physician or other health care professional or any information contained on or in any product label or packaging. Mind, Soul, and Selfcare products are not intended to diagnose, treat, cure, or prevent disease or illness. Please consult your health care professional/physician before taking and using especially if you are on any medications to avoid any potential interactions. By purchasing these products, you release Mind, Soul, and Self from any and all liabilty.